Computer Interface: A Video History — A talk by Jamie Zigelbaum :: July 24, 2009; 8:00 pm :: Machine Project, 1200 D North Alvarado, Los Angeles, CA. 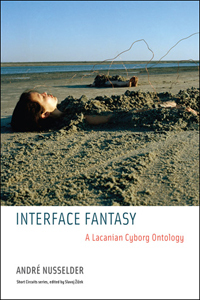 Interface Fantasy: A Lacanian Cyborg Ontology by André Nusselder, MIT Press — Cyberspace is first and foremost a mental space. Therefore we need to take a psychological approach to understand our experiences in it. 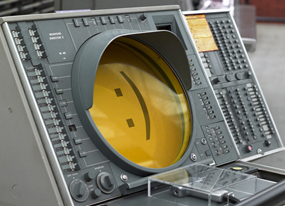 In Interface Fantasy, André Nusselder uses the core psychoanalytic notion of fantasy to examine our relationship to computers and digital technology. 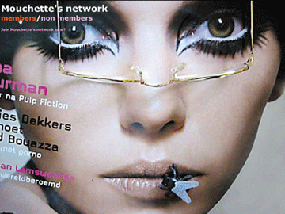 Lacanian psychoanalysis considers fantasy to be an indispensable “screen” for our interaction with the outside world; Nusselder argues that, at the mental level, computer screens and other human-computer interfaces incorporate this function of fantasy: they mediate the real and the virtual. Greg J. Smith writes: I’m happy to report that the Handbook of Research on Computational Arts and Creative Informatics will be released sometime in the next several weeks. I contributed a chapter entitled “Information Visualization and Interface Culture” to this book and in the space of about 10,000 words I outline a few backstories related to visualization. These include: an survey of early radar technology, Vannevar Bush’s Memex, the Head-Up Display (HUD), an excavation of the Graphical User Interface (GUI), the obligatory salute to Edward Tufte and an examination of John Maeda’s Aesthetics + Computation Group at MIT. The text isn’t entirely about timelines and technology as I use texts by Lev Manovich and Alan Liu to consider the cultural implications of pervasive interface culture. The chapter also includes some exemplary work by Ben Fry, Stamen Design, Burak Arikan, lab/RAD and a team comprised of José Luis de Vicente, Irma Vilà and Bestiario. More here. V2_Events: Test_Lab: Artistic Interfaces :: March 12, 2009; 8:00 pm :: V2_ Ground floor, Eendrachtsstraat 10, Rotterdam and Streamed Live.